What is this project? The Weimar period in Germany proved to be a major hotbed of astrological innovation in the twentieth century, yet many of the source texts remain untranslated and, therefore, are inaccessible to anyone who cannot read or understand German. I am creating a series of German astrological source works to finally allow others to have access to the fascinating conversations taking place in print in pre-WW2 German culture. By supporting this project, you enable me to flex my superpower to bring those materials over to you. Once these source works begin appearing, I hope they enrich and further the current conversations taking place in our astrological community. In order to accomplish this, I need to begin at the beginning: translation of the public domain material. This includes most material published before 1923, which gives me 12 years to start with until 2019, when (fingers-crossed) the US copyright laws release more material into the public domain. Once these translations are underway, the project will coalesce into a series of publications perhaps organized by theme, perhaps produced in volumes of what happened to get translated first. Cultural transfer is the most critical way I can contribute to the astrological community. 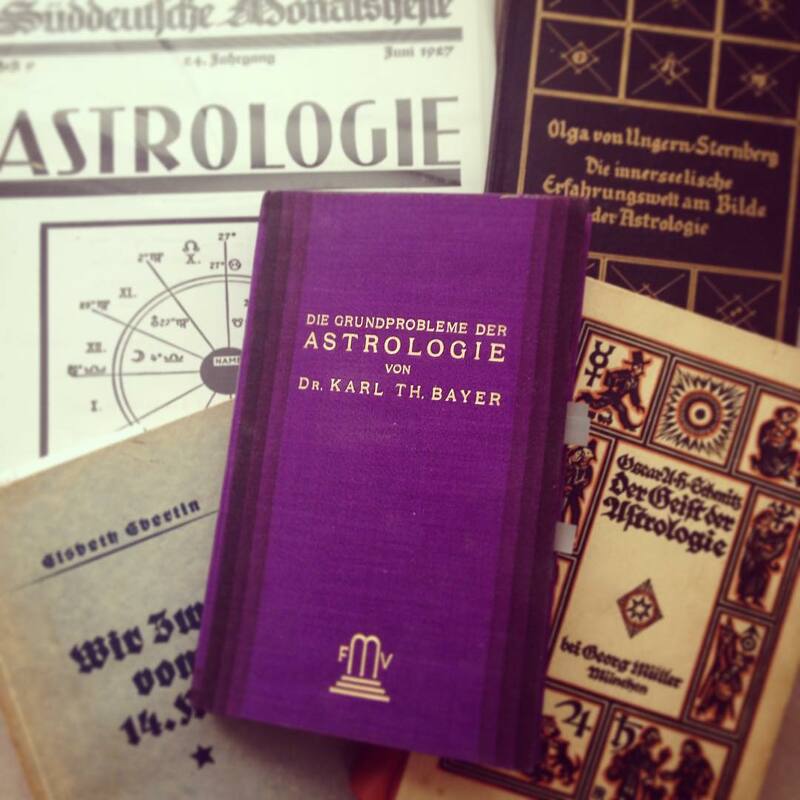 From the very outset of my astrological career in 1997, I committed myself to becoming fluent in German so that one day, the English-speaking world of astrology would be able to benefit from this rich archive of material. My first goal in that project was to become fluent in German (since 1998), and complete formal education to the highest level with a PhD thesis on the cultural significance of astrology in Germany, which I achieved in the German Department at UC Berkeley in 2012. My second goal was to complete an MA in the history of astrology. People always ask why this came next, and not the other way around. I did this in reverse order so that the school, in this case University of Wales Trinity Saint David, would be able to boast having students with PhDs studying the history and culture of astrology in their program, which, I hoped, would raise the stature of the program. In addition, this program enabled me to explore more technique-based astrological publications that were off-limits in the UC Berkeley German department. I completed the MA in Cultural Astronomy and Astrology in July of 2016. Now I have embarked on the third phase: translating and publishing the source texts that were pivotal to my research. I have spent the past twenty years getting ready to make this possible for the community. Commencement from a degree (or two) is just that, a new beginning. The real work starts now. UPDATE: In June 2018, the University of Wales Trinity Saint David appointed me to the position of Honorary Research Fellow. This means that the university is allowing me to have access to their library resources and put their stamp of sponsorship on all future publications of this project. What this does not mean is that I get any financial support whatsoever from them. Therefore, your investment in my project is critical to me being able to accomplish this work. This introduction is already quite long, so for more background into who I am, what I do, and how I'm uniquely qualified to do this project, I invite you to listen to my interview with the Association for Young Astrologers available here at this link. There you'll learn more about my motivation and some of the deeper issues surrounding this project and how it fits into the current state of our community. What have you already done so far? My second translation, nearing completion, is of Elsbeth Ebertin's first book Königliche Nativitäten (Royal Nativities), from 1915, which launched her into fame. Read more about Elsbeth's life and works in my article in The Mountain Astrologer, available on AstroDienst and my guest appearance on The Astrology Podcast. On the column to the right, I have set up a series of monthly support levels, in the spirit of true patronage. By donating at the $2 level and above, your name will appear in all print versions of what I am producing. At the $5 level and above you get the added benefit of voting on what comes next. At the $10 level and above, you will receive a copy of each print publication I make before they are available to the public, and twice a year, you will receive custom-designed postcards for your personal use. I design the postcards based on the primary source materials I'm translating. At the Regulus Guild level, you are making a public declaration of your support for female entrepreneurship and the translation of astrological works by important historical female astrologers. You receive all benefits of other levels, plus signed copies of the publications as they arise as well as other perks outlined in the award level. The Regulus Guild is limited to 12 members. If you would like to give more support, you may overreach any of these levels by as much as you feel called to give. Every ounce of support serves to speed up the production and publication of this material, so if you want to see it quickly, get your peers to join you in supporting this! The faster it happens, the more we all benefit! Thank you for taking the time to consider supporting me! 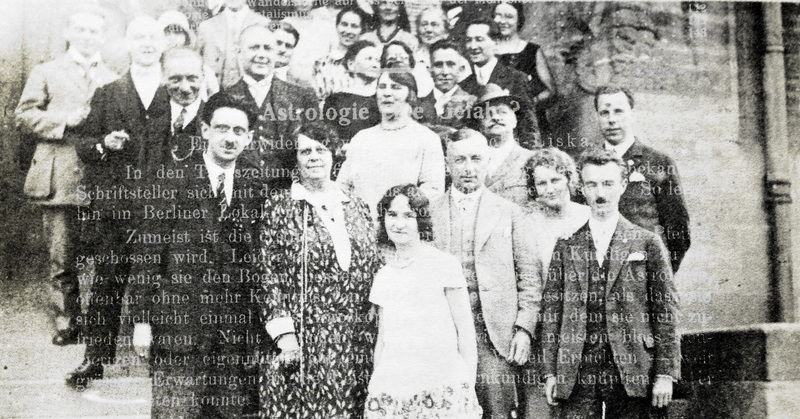 Pictured above: Astrologers at an astrological conference in Nuremberg in 1929, including Elsbeth and Reinhold Ebertin. At this level you join the Regulus Guild. This project was inspired in part by Elsbeth Ebertin's astrological publications, which she produced through her press, Regulus Verlag. Your pledge at this level is a public declaration of your commitment and support of female entrepreneurship (past and present!) and the translation of works by important historical figures in the field of astrology. The year 1919 marked the start of the Weimar Republic. Achieving this goal will significantly improve the speed of this project. More output equals better value for your contribution (more books on your shelf!) and quicker access to these materials for everyone.